The most comprehensive online list of the best places to take photos in Austin, TX and surrounding areas. 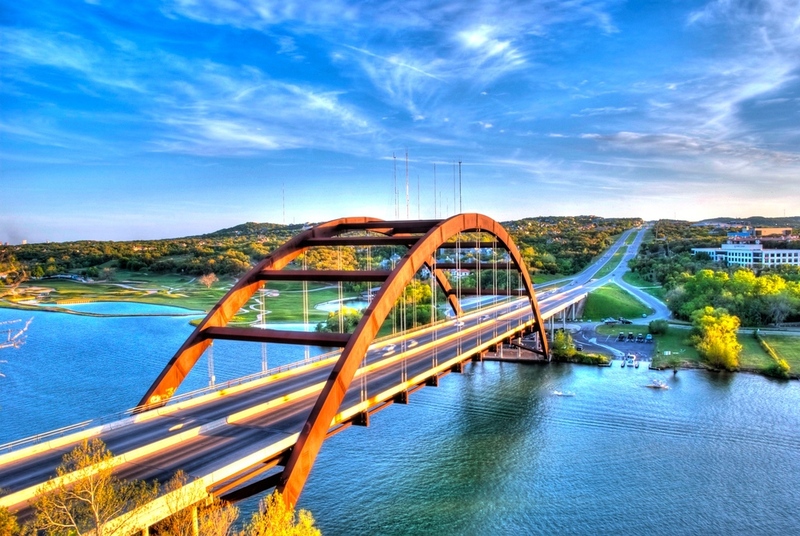 It includes rivers and lakes, cityscapes and skyline photos, the best sunset spots, the Texas State Capitol complex, bridges and architecture, museums, graffiti and many other unique and interesting spots in Austin. If you find this page useful, note that I have created an eBook about photographing the city of Austin, which you can find here. 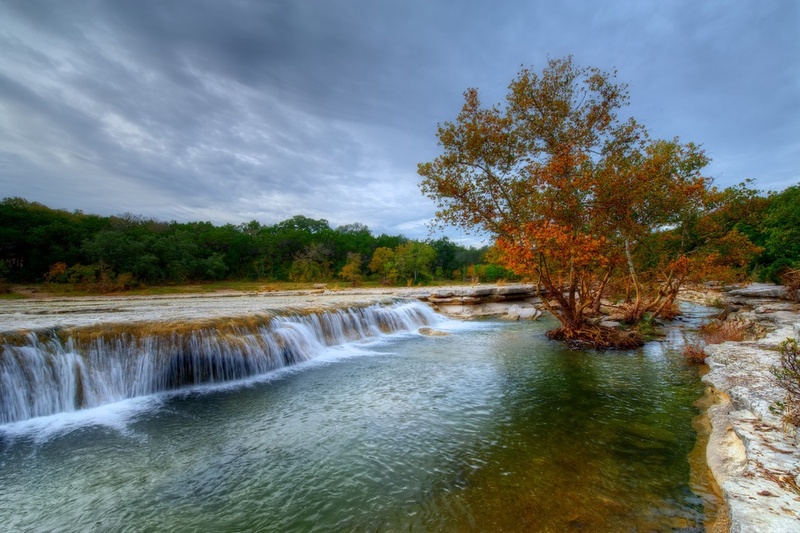 It's your virtual guide to the best photo spots in Austin! It is 113 pages and full of over 150 images, maps, tips, tricks, and more. It's available for $7.95 and you can download it immediately and start shooting! It contains more sites, more information and way more photos than this list, along with a bonus section which includes another 16 sites in central Texas. Read about it here and let me know if you have any questions! Thanks for taking a look and have fun out there! Are you looking for the best places to take photos in Austin? Are you looking for a photography guide to Austin? Do you love history and architecture? Do you love beautiful rivers and waterfalls? Wide-open vistas, nature and gardens? What about cityscapes and skylines? How about the funky sort of stuff, like Airstream trailers and cool signs? Graffiti? 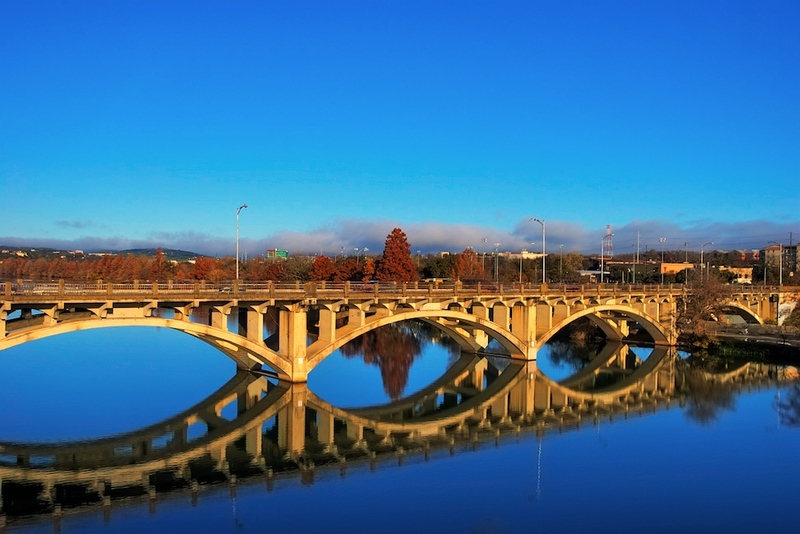 Well Austin has it all, so read on! Austin is a wonderful town to live, work, and play in and it just so happens that it is also a wonderful town to take photographs in. I have spent countless hours cruising around town looking for cool and interesting things and places to photograph. This list is clearly not exhaustive, and surely some of you will come up with additional great spots around here that I left off the list. There are so many to choose from! Suffice it to say that these are my favorite spots that I have photographed - so far - and I am sure more will make it onto the list in the future (and plenty more are in my eBook). Some of these will be fairly obvious, such as The Capitol, but hopefully some will be a little less well-known and provide you with some inspiration to get out there with the camera and get busy! And if you find some good ones that I forgot to include, just add them to the comments section below! The Capitol building is a massive structure made of pink granite and stands 14’ taller than the US Capitol. It is very well-known and often-photographed. I have been there several times and I enjoy it immensely. You can also get into the House and Senate Chambers for some cool shots, if they aren’t in session, that is. It is worth a visit and the nice thing is that they don’t mind if you are toting around a tripod. There is also a great area on the lower level that you can reach through an elevator - fun to explore and photograph! This one is from inside the Senate Chambers (or is it the House? Hmm). Worth a visit for sure! The UT campus is huge and therefore offers so many great spots to photograph. 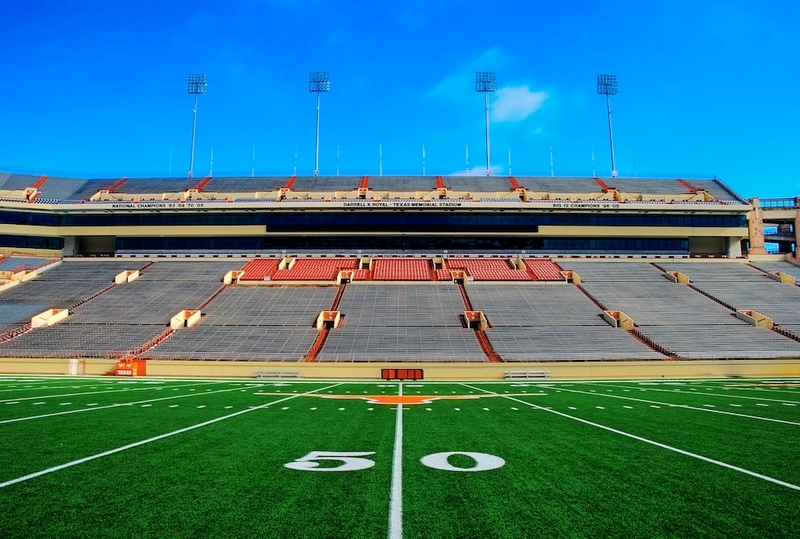 There is Memorial Stadium, where my beloved Longhorns play football, there is Littlefield Fountain which is a real beauty, and there is the UT Tower which seems to stand guard over it all. There are also countless nooks and crannies that are great fun to explore with a camera! 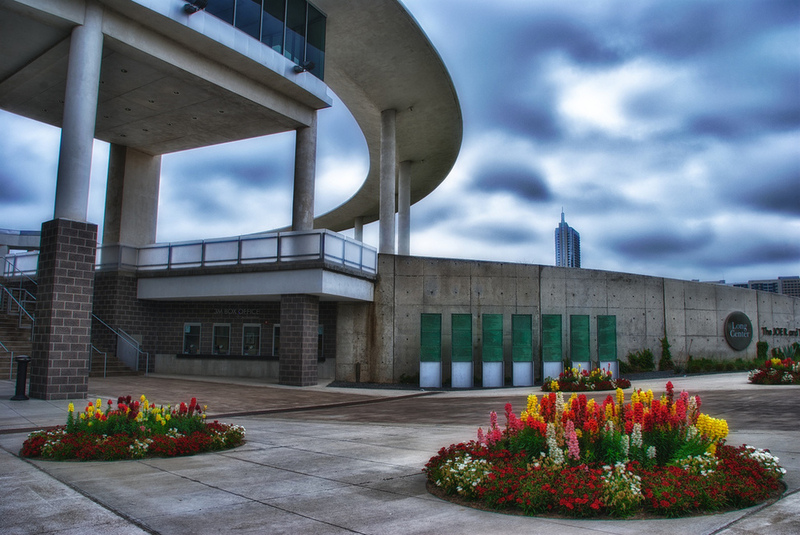 This is a great spot for architecture shots! I love the skyline of Austin, even with the continual changes it seems to be undergoing. I find it very pleasing to look at. I think the best place to photograph it is from the Lamar Street Bridge, not the pedestrian bridge but from the bridge the cars ride on. It is a little tight but you can stand there with your tripod and get quite the photo of the skyline with the river running next to it. Come at night for an extra cool shot with all the towns lights twinkling and reflecting in the water. Another great spot to shoot the skyline from is Auditorium Shores. In fact, that might be my favorite spot. Hmm, I am a little undecided on this one. Go shoot both! You'll be glad you did! This is the same bridge I mentioned in #3, but instead of standing on it, go under it or go over to the pedestrian bridge I mentioned and shoot back to this one, so you can capture all the arches. (The pedestrian bridge is next to the car bridge.) It has some beautiful symmetry to it and if you can catch it in the morning light it is really something special. This bridge sits about 20 minutes or so West of downtown and is a beautiful structure. 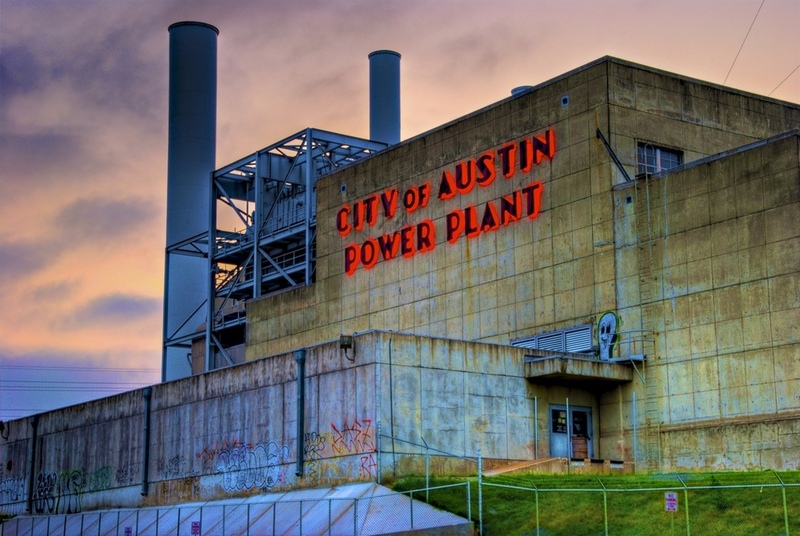 It is one of the few iconic symbols of Austin and seems to only get prettier every time I see it. There is a well-known area next to the bridge where you can climb up the rocks to get a nice birds-eye view of it, but I also recommend parking and walking down below the south side of it for some interesting angles. By the way, I believe this is the best place to shoot the sunset in Austin. I just love the view and every once in a while you get a crazy awesome sunset like this one - so fabulous to witness, and fun to shoot! 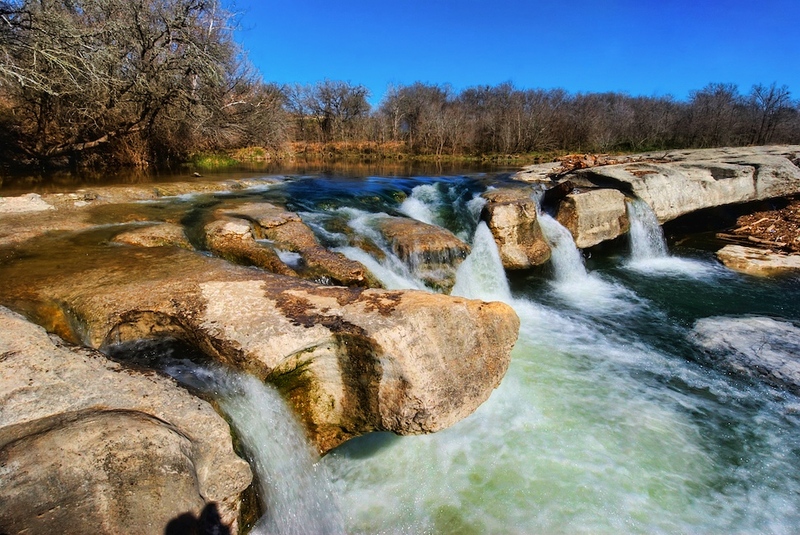 This wonderful place is about a 30-40 minute drive from Austin but it is well worth it. It is a natural pool that was created when the dome of an underground river collapsed due to erosion thousands of years ago. The main highlight is the 45 foot waterfall that cascades over the rim from above, crashing into the pool below. It’s gorgeous. I’m fired up just typing this. Go there now. This is a 30 acre park which is tucked away inside the larger and more well-known Zilker Park - Austin’s 350 acre version of NYC’s Central Park (sort of). It has several different sections, including a rose garden and a Japanese Garden, but for me the highlight is all the flowers you can find there, especially in the springtime. Oh, and don't miss the waterfall! This park lies outside of Austin about 30 minutes or so, and is great fun to visit. There are ample hiking opportunities as well as general photography fun to be had. 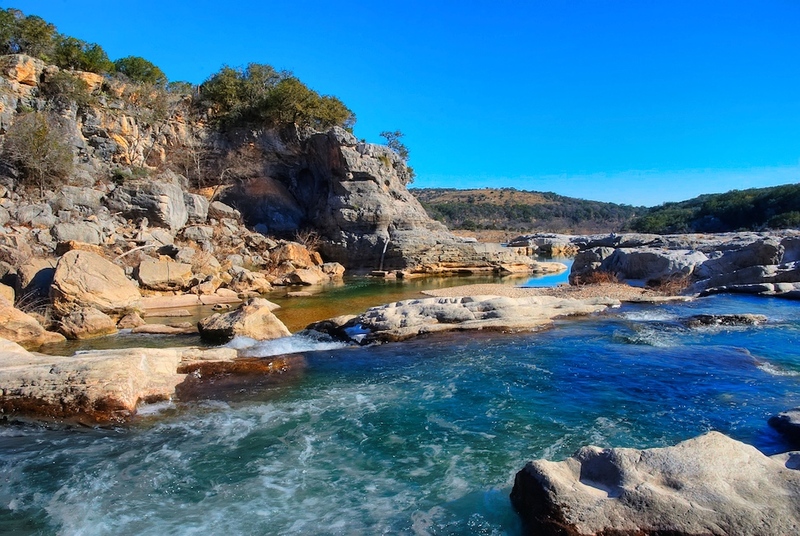 The Pedernales River runs through the park and there are so many boulders and rock formations that you may never tire of looking at all the ways the river can move through the rock. It is interesting, fun, good exercise and great photography - all in one. I was surprised at how beautiful this place is when I first visited with camera in hand. 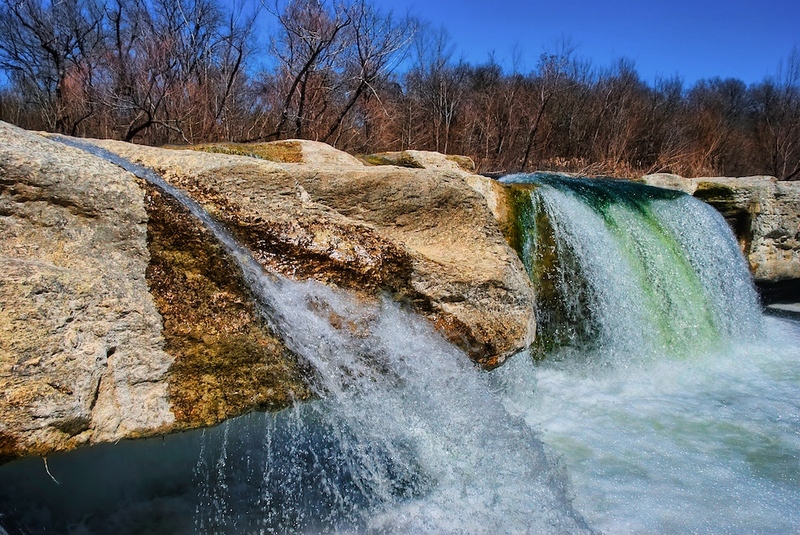 It is actually in Austin, just a 15-20 minute from downtown, and if you can get there in the spring you will be rewarded with wonderful waterfalls with a lot of water flowing through them. It’s really beautiful! This is the Grand Dame of Austin Hotels. It was built in 1886 as the showplace of cattle baron Jesse Driskill and sits on 6th Street in the middle of the entertainment district in downtown Austin. It is iconic, historic, and beautiful. Walk around the lobby, go upstairs, visit the bar, and get a shot of the horse-drawn carriages out front too! Bull Creek is my "home trail", by which I mean that it is both close to my home in NW Austin and the one that I consider to be "mine" if you know what I mean. It's completely awesome and a great trail for a run in the woods, but of course I love to photograph it too! There's a lot of awesomeness here! And when we get a nice rain, the waterfalls really get running!! Airstream trailer restaurants, funky stores and cool places! Here's one of the famous food trailers there, a cupcake place known as Hey Cupcake! 13.) 6th Street - the famous entertainment area! Lots of people watching here - but my personal preference is to get up early and shoot it at sunrise - on a Sunday morning - you'll have it all to yourself! 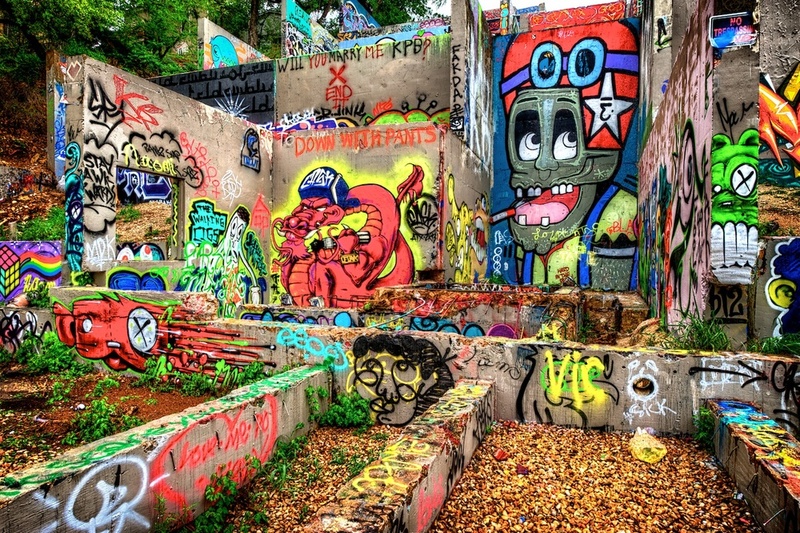 This one is pretty cool, if you like graffiti (and I do). It's near downtown, just off Lamar Blvd between 11th and 12th Streets. Come back often - it changes ALL the time! Technically, this one sits on the campus of the University of Texas, but there is a lot here to shoot, inside and out. Be sure and swing by - and the art exhibits are awesome too! I just love the curves on this bridge! It's the one I stood on to shoot the Lamar Street Bridge (#4 above) and it's also a great one to stand on and shoot the skyline. You just gotta go see this place - isn't it lovely?? I love that huge bronze star! This one is turning into a mixed-use development, which is another way of saying it's turning into condos and retail stores. I think it will turn out pretty cool, and I think the neon sign will stay, but hurry up and shoot it just in case! This is a series of trails that lies just a few miles from downtown, but feels a world away. I used to run and bike here all the time. In the spring when it rains, the creek really gets going! As I mentioned earlier, there is an entire wall of graffiti downtown. But I also found a cool spot just off the Interstate near 4th Street where there are a bunch of cool murals like this one! This is a huge performing arts complex, and I just love all the lines and angles here. It sits just south of the river from downtown, and gives a great view of Austin from the top of the parking lot too! This is a little island with a dog park on it that sits just below Tom Miller Dam, on the far western end of Lady Bird Lake. It's just a quiet, peaceful place. This place is beautiful! It's a short drive north from downtown but sits on the edge of one of our lakes. The ground are fabulous (very popular for weddings) and I love the old architecture of the main building. Ok, this technically isn't in Austin, but it's close enough (~30 minutes) and awesome enough to add to this list. And since you want to capture as much as you can, give this one a visit - it's beautiful! I love finding stuff like this in the middle of nowhere! This one is just awesome, and is recently restored. It's downtown on South 1st Street on the side of a business called Roadhouse Relics. Just go south on South 1st Street and you will find the place. By the way, this is an iPhone pic. Even though this isn't in Austin, it's pretty close and let's face it - it's just cool. It's an old Texas gas station which is now a private residence, or so I have been told. It's just got character, and that goes a long way with me. I have driven by here for years, and always wanted to stop and take photos of the entrance - so I finally did! Ain't it awesome looking? This is a once-yearly event that happens each June here in Austin. Thousands of bikers from all over ride into town, and it's crowded, noisy, and fun. There is a motorcycle parade to watch, and it's all a lot of fun too. My favorite though is to get up early one morning and head downtown to shoot the street scenes when they are all empty. This park in West Austin is best known for the peacocks that wander the grounds, but it's also a great place to photograph the flowers, with some little ponds and nice gardens thrown in as well! This place is famous for it's sunset view over the lake, which is pretty great. But it's equally famous for all the steps you have to climb to get up here. It's a pretty good workout! This area continues to get redeveloped (or gentrified, if you will) and frankly, I love the area. Lots of cool little spots, cool restaurants, and cool signs. Quite fun with or without a camera! This street, also known as The Drag, winds its way next to the University of Texas campus, and you can find all sorts of interesting things while wandering there. I'm a fan of the graffiti myself, and if you get a nice sunset, well, the place looks pretty awesome! A little further up The Drag (heading North), is an old bar known as The Hole in the Wall. Honestly, I have no idea how old it is, but it has been around FOREVER. I like places like that, and since you are likely going to be nearby, stop in for a shot (a photo, I mean). A little graffiti, a little grunge, and plenty of awesomeness. This is a great looking building that sits downtown, around 4th Street or so (you can't miss it really) and in the right light, I think it just glows. I grabbed this one from a parking garage nearby, which is always a good idea to get a new perspective on a town. There's a great little food truck trailer park sort of thing down on South First St. In addition to the wonderful food, be sure and grab some snaps of the place! Sadly, I believe this trailer has been moved, and I don't know where it went. 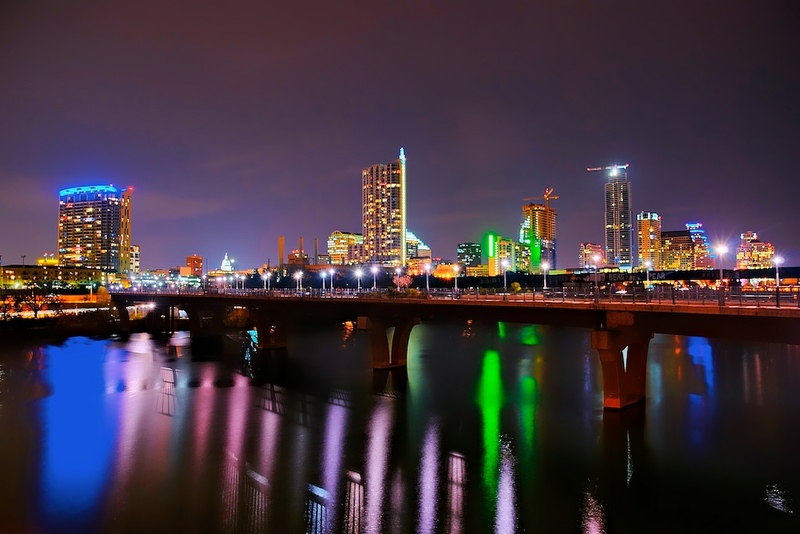 I really like the Austin skyline, and never tire of looking at it (or shooting it, of course). That also means I always look for new places to take a photo of it, because, well - I'm addicted to this stuff. So Lou Neff Point is a good one. You sort of have to park in Zilker Park and walk, but it's worth the view! This is a peaceful, almost contemplative spot really close to downtown, and thus easily accessible. There are a lot of sculptures here, which makes sense, because it's a sculpture garden! Have a look around and enjoy! Yes, we actually do have a few wineries in the Austin area, even though this is Texas and everyone thinks we just eat BBQ and drink beer (we do that too, though). This one has a fabulous Italian restaurant, Trattoria Lisina, and taking a little tour of the winery (and sampling a few!) is a great way to spend the day. This is just down the road from #26 above, so get two spots done on one trip down to Driftwood! This place bills itself as the Sunset Capital of Texas, and I have to admit it is pretty stellar, especially if you catch it during a real stunner like I did one fine evening! It's a little bit of a drive outside of town but worth it for the view! Nothing like a cool, crisp morning swim in 68 degree water, right? People get up every morning and do just that right here in Austin at Barton Springs Pool. Seems crazy to me, but then again I get up before sunrise to go take photos! Another great spot downtown, this sculpture is often visited and often photographed, but it's pretty awesome too! This is an old country and western bar and dance hall. I admit I have never set foot inside, but I have shown up before dawn to take photos of it! There is also a great neon sign out on the street that is worth shooting too! There are a few square blocks right around 4th Street and Congress Avenue that have been "gentrified" and updated, and now contain restaurants and bars. It's a nice little area for some cityscapes. I just love cool signs, and this one ranks right up there. 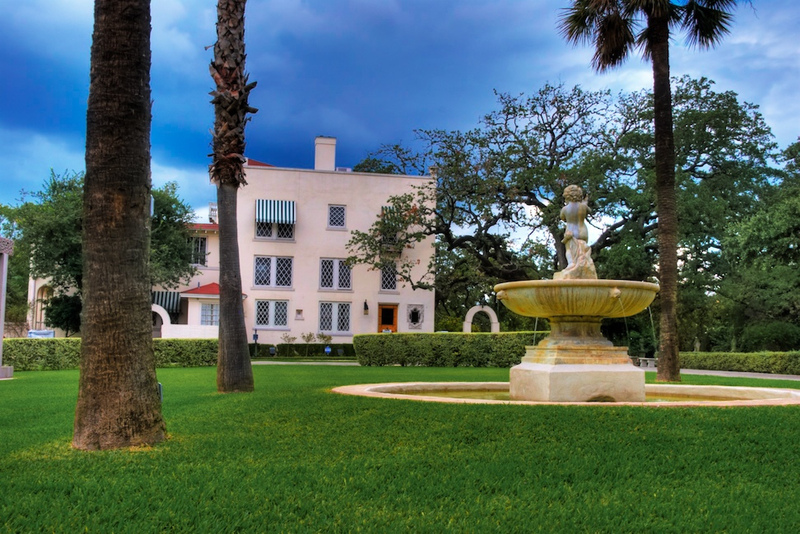 It's situated on Congress Avenue and is particularly nice at night! I am sure that there are a million more great spots to shoot in Austin, and I will keep looking for them and keep adding them over time. So check back for updates! Hope you have a good time out there taking photos, and let me know your thoughts on the list! Feel free to make additions by way of the comments field! If you found this page useful, note that I have created an eBook about photographing the city of Austin, which you can find here (or click the graphic below). 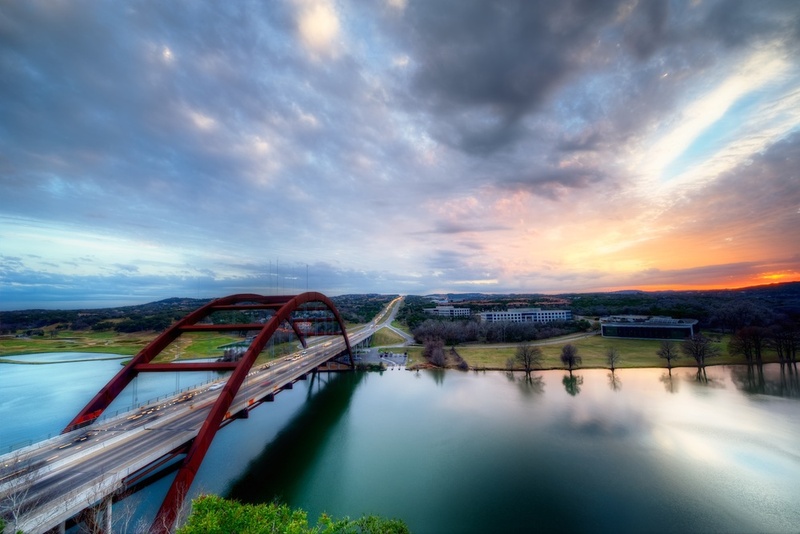 It's your virtual guide to the best photo spots in Austin!